Imagine that you were able to walk through a wall, what would you call yourself? A Ghost? A Magician? Now, it may sound absurd for this to be true, but in quantum physics this is something quite close to being true. But, if we were to dig deeper, these studies have helped ius understand something much more than magic, bringing us closer to our fantasies, but also rationalising it. Born at Oranienberg near Berlin on January 8, 1891 Walter Bothe was not only a renowned nuclear physicist, but also an accomplished musician and a painter. After returning from Russia in 1920, he developed the coincidence method and applied it to the study of nuclear reactions, Compton effect and wave – particle duality of radiation for which he would receive the Nobel Prize in 1954. Walter’s father was Fritz Bothe, a merchant. He studied, not only Physics but even mathematics and Chemistry at the University of Berlin from 1908 – 1912 and then under the apprenticeship of Max Planck, he obtained his doctorate for the study of the molecular theory of refraction, reflection, dispersion and extinction. He continued his study from 1915 – 1920 when he was held captive as a Prisoner of War in Russia, during the First World War. During his stay in Russia, he also learnt the Russian Language and fell in love, and brought home with him a Russian bride, Barbara Below. He became the director of the Physics department at the University of Giessen. In 1932, he became the Director of the Physical and the Radiological Institute at the University of Heidelberg, but he was driven out of his position and was appointed as the director of the Physics Institute for Kaiser Wilhelm Institute for Medical Resarch (KWIMF), where he built Germany’s first operational cyclotron. When Hitler was the Chancellor of Germany a nuclear energy project was started, known as the Uranverein (The Uranium Club) under the supervision of Army Ordnance Office in 1939. One of his most notable collaborations was with Hans Geiger, the inventor of Geiger counter. He worked as Geiger’s assistant at the Reich Physical and Technical Institute. Geiger had developed the needle counter which not only responded to heavy particles, but even electrons. This needle was used to set up the experiment, two needles, across a common front wall in the atmosphere of Hydrogen and a beam of X-rays. The observations obtained established the accuracy of any temporal “coincidence” between the needles being 10-4 second. Walter also studied the transmutation of light elements with the bombardment of alpha particles in 1927, which were related with the nuclear energy levels and the nuclear interactions of the reaction products. In 1929, after collaborating with Werner Kolhörster and Bruno Rossi, Bothe began with the study of Cosmic rays and its radiation. Bothe was to continue with this study or the rest of his life. His study which won him the Nobel Prize, was a study that spanned over thirty years, refining and improving his methods to achieve better results, and he was also essential in helping with the construction of the Cyclotron, which was completed in 1943. And it was inaugurated on June 2, 1944. However, the Allies seized it at the end of the Second World War. 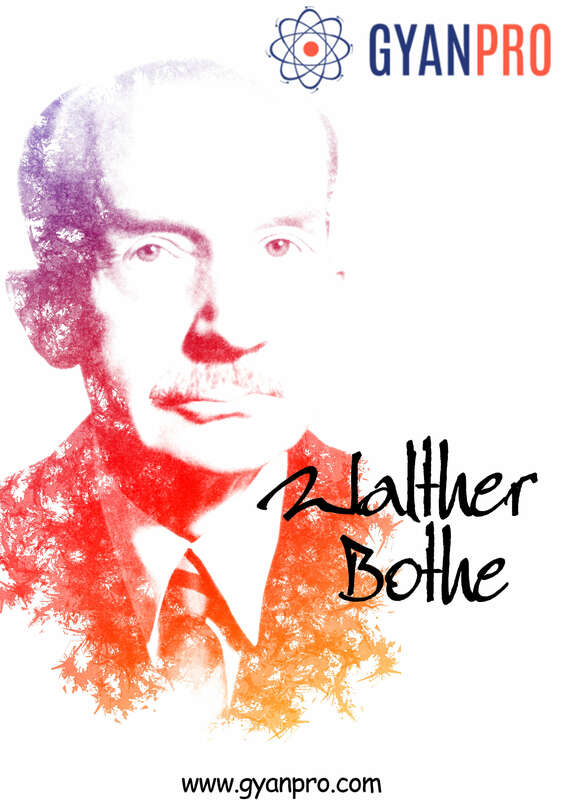 Walter Bothe was a German patriot who did not give excuses for his work with The Uranium Club. During his lifetime he received a numerous honours including the Knight of the Order of Merit for Sciences and the Arts. Into the Universe with Stephen Hawking. Newton’s Rediscovery of Gravity!! Eugene Augustine Lauste: From freeze frame to motion pictures An Invention that Shocked the World – The Story of Joseph Erlanger.